Oh, no! The cats are fighting again. They’re hissing. They’re growling. The fur’s flying. Will they ever manage to get along? Although it may not seem like it if your cats are feuding, most cats hate to fight and will do almost anything to avoid a real confrontation. When cats are fighting, it’s usually because one has trespassed onto another’s territory. While unneutered males are notorious for fighting, neutered male cats and spayed females will also fight to defend their turf. In fact, females tend to be even more territorial than males. When cats are fighting, breaking them up isn’t easy, and some are determined to duke it out, no matter what you do. But here are some things to try. Startle the combatants by making a very loud noise, like clapping your hands or banging pots together. Toss a pillow or something else large and soft in the direction of the battling cats. If the cats are fighting outside and your garden hose is hooked up, spray water on them. They won’t mind, and they might thank you for encouraging them to go their separate ways. Don’t try to separate them with your hands. You will get bitten! Although there’s no referee and no one to ring a bell, when cats are fighting, they tend to do it in rounds. They’ll roll around on the ground or floor kicking and biting, separate for a minute and then go back for round two or even three. If the cats are inside, try to distract them by tossing treats in two different directions when they’ve separated. Or toss some small, noisy toys. Your objective is to get them to concentrate on doing something else so one can leave the battleground without losing face. It’s also possible to keep them from making eye contact with each other and resuming the fight by standing between them if they’re calm enough or by holding something like a large piece of cardboard between them and gently guiding one of them in another direction. This is helpful outside, where tossing treats or toys probably won’t get their attention. But don’t stand between them unless they’re several feet apart. You need to be able to get out of the way if the fight starts again. Your cat’s body language can tell you a lot about the mood she’s in. While cats often hiss, growl and even swat at each other to make sure one isn’t encroaching on the other’s space, the language of an impending fight reaches a whole new level. Trying to stare the other down. The cat’s back and the hair on his back are raised. The tail thrashes back and forth. The ears are flattened sideways or back against the head. The cat turns sideways to his opponent instead of approaching him straight on. What you say doesn’t matter as much as your tone of voice and your attitude. Cats pick up on our thoughts, and if you’re calm, they might calm down, too. Then toss treats or toys in two different directions to move them away from each other and get them to think about something else. Never stand between two cats who are about to fight. One could attack you instead of the other cat. Don’t try to pick one of them up, either. The cat is agitated and ready to attack anyone who comes close, including you. If you can make each cat’s indoor territory the land of plenty, they won’t have a reason to fight. This is especially important in multicat households. Make sure there are many litter boxes in many locations and food in all the places where the cats feel comfortable eating. When several cats live together, they also need many high places so they can arrange themselves vertically and many low places for hiding when they need a break from the others. Create little sanctuaries throughout your house with food, water, a cat bed and toys so each cat can have his or her personal space and some alone time. Just like people can take an instant dislike to each other, some cats truly hate each other at first glance and won’t get along, no matter what you do. 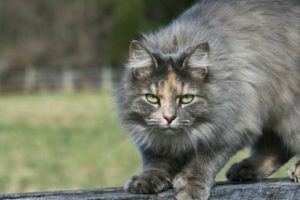 If it looks like your cats will be feuding — and fighting — for life, you might want to give some thought to rehoming one of them. While this might be painful for you, it will be better for the cats. No one should have to live with an arch enemy for life! If rehoming one of the cats isn’t a possibility, subdivide your home into equally nice territories so the cats can all live in peace. One way to keep them separated is by stacking baby gates on top of each other. If your cats go out, think about rotating them in and out, so one is outside while the other is indoors. If they live outside, try to help them establish separate territories by putting their food and shelters at opposite ends of the yard or put one cat’s food and shelter in front of your house and the other’s in the back. Cats fighting is scary for both humans and cats, and it’s best to help your cats avoid fights when you can.